Here at Tri County Ninja, we believe that ninjas work best in packs. Whether you choose to make obstacle course training your new date night, or a safe environment for your kids to blow off some of that infinite energy they store throughout the day, the family that runs together runs furthest. 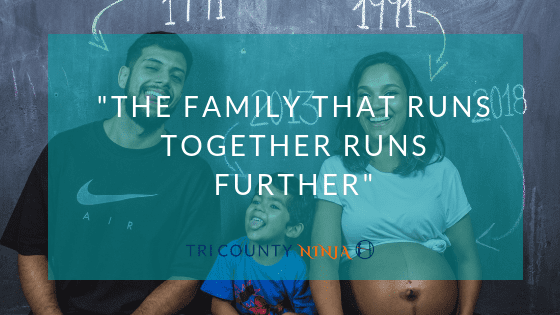 Family has always been a strong motivation for us, let’s take a look at 3 big ways ninja training could benefit your family. Exercising as a family promotes health. Tri County Ninja’s indoor obstacle course provides a family friendly place for your family to exercise. You already know the physical benefits of exercise such as more energy, strength, and longer lifespan. Share the excitement of living a healthy lifestyle with your family, and become stronger – together. Whether you are looking to supplement your personal workout routine, or forego the babysitter and include the family on your exercise plan, burning calories with your family promotes a healthier lifestyle and attitude. Ninjas have no off-season, and neither do you. We know how bad the weather can get here in Fenton, Michigan. Maybe you have a child or children, and know how difficult it can be to find somewhere for them to get their energy out during those frigid winter months when the weather dips down to freezing. Maybe you’re an adult used to a sport like soccer or football with a bit more mobility than you can find from a typical gym during your off season. No matter what your need, no matter what the season, and no matter the weather, at Tri County Ninja, your family has a comfortable place to train on our obstacles and obstacle courses. Apart from our obstacle course, we also offer indoor fitness classes year round, as well as birthday parties and other events. Build confidence, shape memories. Rather than focusing on winning or losing, Ninja Warrior training and obstacle course training focuses on working with others to improve yourself. Challenging yourself and your family to beat their own obstacle course times will not only give them concrete evidence that effort yields results, but confidence that they can learn to do new things, and excitement at the things they are capable of. You may not remember the course times, or the obstacles they ran on, but you will remember the looks on their faces when they felt themselves becoming better, and they will remember your voice helping them get there. Ninja training obstacle courses provide a wonderful atmosphere for support and encouragement for all types of loved ones, and best of all, it’s fun! Family has been and remains a driving force behind our business and we hold the idea of family very near to our hearts. Whether you have children or not, whether you are married or single, family is family, and to us, nothing is more important. Come try out our obstacle course and obstacle training in Fenton, Michigan to lead your family towards a healthy, supportive, exciting hobby in a safe, comfortable, friendly environment.